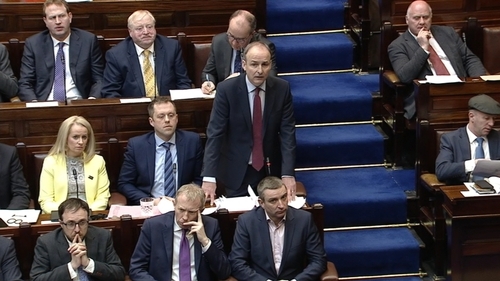 There were sharp exchanges in the Dáil between the Taoiseach and the Fianna Fáil leader after Micheál Martin accused Leo Varadkar of resisting the release of information on the controversial Strategic Communications Unit. Mr Martin said revelations under the Freedom of Information showed how €180 million of advertising revenue would be channelled through the Taoiseach's office, giving enormous leverage with the media industry. Mr Varadkar acknowledged that the SCU has become a distraction and that mistakes have been made. He told Mr Martin that controls were too loose, problems had arisen and that is why it is under review. He said the original idea for the SCU came out of the Global International Forum and was suggested by former tánaiste Eamon Gilmore. Mr Martin said there was a "party political dimension" to the recent advertorials at the centre of the row, adding that four marginal consitituenciues just happened to have Fine Gael candidates "emblazoned across paid ads, paid for by the taxpayer". The Taoiseach strongly rejected the assertion that he tried to block information being released, saying civil servants decided what material gets released under FOI. Mr Varadkar said there had been a lot slurs being thrown around, and said the accusations from Mr Martin were personalised and venomous towards him and his staff. Sinn Féin leader Mary Lou McDonald said that in Budget 2018 the SCU was allocated €5m - one third of the additional money promised for mental health. She said the unit is now "mired in scandal" and that the "spin unit has followed a strategy to promote Fine Gael in a very underhand and unprincipled way by directing editors to present paid for political advertising as regular news articles". She accused the Government of using public money and the resources of the civil service, which is prohibited from being used to advance the party political objectives of whoever is in Government. Earlier, Sinn Féin's finance spokesperson Pearse Doherty said his party's motion to disband the SCU will be debated in the Dáil after the St Patrick's Day holidays. The Donegal TD said Mr Varadkar and the Secretary General of the Department of An Taoiseach, Martin Fraser, should appear before the Oireachtas Public Accounts Committee to answer questions on the unit. It is understood that at Cabinet today ministers accepted that mistakes had been made but were broadly supportive of the SCU. Several ministers said that a coordinated approach to Government communications was needed.